on monday, after i uploaded the iPhoneDevCamp video, my shared at dreamhost went craptastic. in complete frustration, i started sending out feelers looking for a hosting provider that loves Drupal. after emailing eric gunderson from development seed, he passed along the name of one Thomas Brenneke from networkredux. if you have downloaded adium, imagemagick, or a fading red, you have used networkredux and did not know it! as supporters of an open source community, thomas jumped at the opportunity and has donated some rack space. over the next few days, we're going to flip the switch and move to networkredux. now i just want to sin! it's funny what hunger and strong coffee can do to the mind. it's more disturbing to have a case of wine sitting behind you, lusting after your free time. low and behold, shortly after the noonish hour, FedEx appeared with my second delivery of the day. right from the michael david vineyards, i now have six bottles of seven deadly zins and six of seven heavenly chards, a t-shirt and a lovely hat! 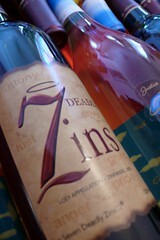 oh what zinful pleasures will come!! !